Sometimes lugging out the food processor for a quick and easy meal just doesn’t seem worth it. There is no doubt that the food processor is the workhorse of the kitchen, but sometimes it just isn’t practical. For those times when you need to chop just a few veggies there is another solution. The Kuhn Rikon Twist & Chop simplifies food preparation. 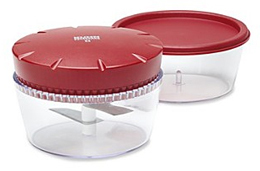 Perfect for creating a small salad, the slicer operates simply by twisting the lid. Just place your food in the container and twist away. The blades are double-sharpened so they cut in both directions. Best of all, when finished, you can just pop it in the dishwasher.